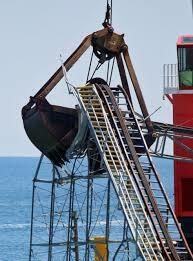 The JetStar became a mangled pile of metal after it was left in the crashing waves when Sandy took out its foundation, the beloved Casino Pier amusement park. In the months since the Halloween storm, the wreckage became a magnet for photographers and “adventurists” – some who tried to walk on the twisted debris and one who even managed to plant a flag, said O’Donnell. The coaster may be gone but the lion’s share of the project – removing the end of the pier that is now underwater – won’t be completed until Labor Day. Weeks Marine signed the contract to remove the JetStar with property owner Casino Pier in April. O’Donnell, who also served as the estimator on this bid, said his company didn’t win the job at first, but Casino Pier was unable to come to agreement with the lowest bidder and called on Weeks Marine a month ago. Since then, he said, timing has been the biggest obstacle. As it turned out, the team got the go-ahead on the very same day England’s Prince Harry happened to be in town. All eyes around the world were on Seaside Heights as Weeks Marine’s crews dismantled the structure, beginning in the early morning hours of Tuesday, May 14. The following day the wreckage had already been hauled away. “Every one was very thankful the job was able to be completed before Memorial Day,” O’Donnell added. Weeks Marine is no stranger to difficult working conditions. The company, whose strength, said O’Donnell, is in “the amount of equipment, the size of equipment and ability to mobilize quickly,” has been on the scene of many of history’s most recent disasters. 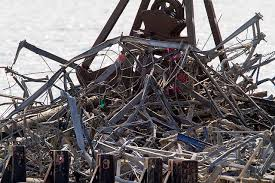 Cranes and barges emblazoned with the Weeks Marine logo hauled debris away from the World Trade Center after the Sept. 11 attacks, lifted the US Airways plane, landed by Capt. Chesley Sullenberger, from the Hudson River, carried NASA’s Space Shuttle Enterprise from John F. Kennedy Airport to the Intrepid Sea, Air & Space Museum and sent hundreds of old New York City subway cars to the bottom of the ocean as a manmade reef.